The Breast Screening Bundle Tool (BSBT) is a web-based tool designed to help radiology practices develop bundled payment models for breast cancer screening. The BSBT calculates the bundle payment for a mix of seven services in addition to screening mammography. The volume and percentage of patients undergoing each service for the tool were estimated with 2013-2015 Medicare 5% Research Identifiable Files (RIF) data. The calculated bundled payment represents a single payment for patients that would cover initial mammography screening and all subsequent imaging screening and diagnostic testing for either: 1) 364 days after the initial screen or 2) a referral for biopsy or positive cancer diagnosis. Users can include any of these services in the bundle they are interested in offering. If a practice only covers specific services in a bundle, such as screening and diagnostic mammography, then the other services in the tool should be assigned values of zero to calculate the bundled payment. Payers will incur a single bundled payment based on all of the services included in the bundle, even if they do not use all the services in the bundle. Further background on bundled payments is available here. The Tutorial section provides a guide to the BSBT and the Methods section discusses the data used in the tool and how the bundled payment is calculated. 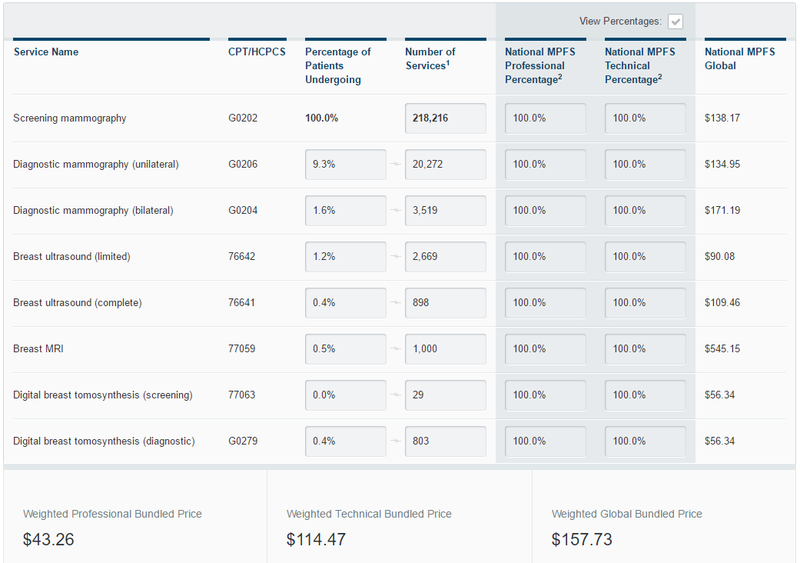 The default appearance of the BSBT includes seven columns of data. 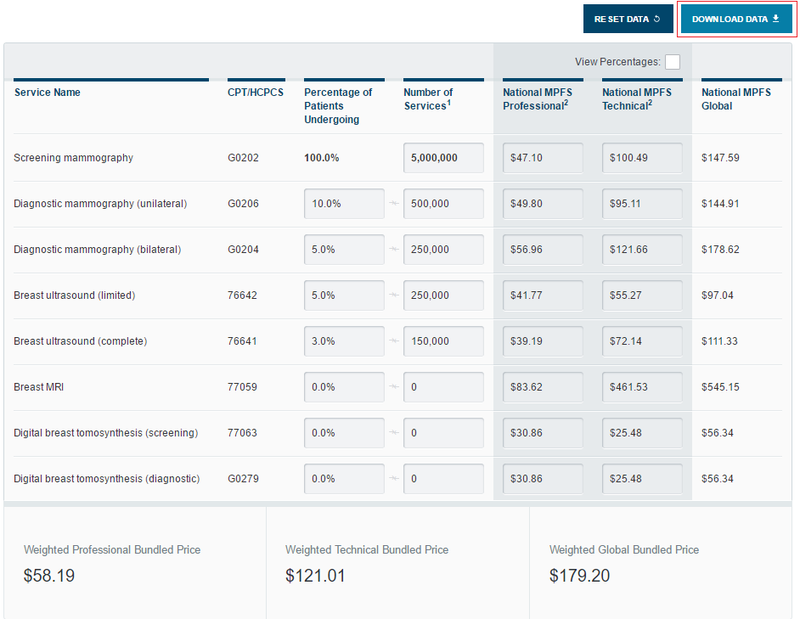 The default values reflect national values for the Percentage of Patients Undergoing and the Number of Services, as well as the national reimbursement rates set by Medicare. There are many ways which users can customize the tool, discussed below. The first two columns display information for each mammography service: 1) The Service Name describes the service offered and 2) The Current Procedural Terminology (CPT)/ Healthcare Common Procedure Coding System (HCPCS) column identifies the code associated with the service. 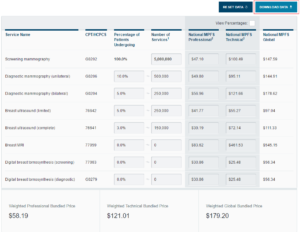 The second two columns display information on the percentage and number of services which users can change to reflect their own data or perform “what if” analyses: 1) The Percentage of Patients Undergoing displays the percent of patients receiving these services in the patient population. The percentage of patients undergoing screening mammography will always be 100%, while the percent values for the other services are customizable; and 2) The Number of Services displays the numerical volume of services, all of which are customizable. Although users do not have to customize the data for their practice, doing so will reflect a more accurate bundled payment. The last three columns display reimbursement information from the 2017 Medicare Physician Fee Schedule (MPFS) needed to calculate the bundled payment: 1) The National MPFS Professional Percentage displays the percent or value of the Medicare professional component reimbursement for the service; 2) The National MPFS Technical Percentage displays the percent or value of the Medicare reimbursement for the technical component for the service; and 3) The National MPFS Global which displays the percent or value of the global Medicare reimbursement. 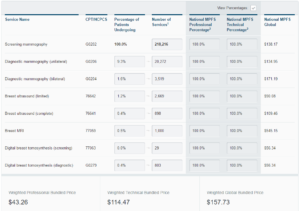 The default view displays the percentage paid relative to the national Medicare reimbursement rates for each service but users can uncheck “View Percentages” to view to the actual dollar amounts. Users can reset the table to the default values, or download the table information into an Excel comma-separated spreadsheet (.csv) when they are finished. After users have entered all the data for the bundled services they are interested in offering, they can download the BSBT table into an Excel comma-separated spreadsheet (.csv) for later reference. The Download Data button is located at the top right of the table. Clicking the Download Data button will automatically begin the download process. You can then open the .csv file to view the table. If users want to start over at any point, they can click the Reset Data button at the top right of the table. This will reset the table to the default values.